Choosing between the stock market and mutual funds will solely depend on your investment phase. Most investors begin with mutual funds since they provide a more systematic and disciplined way to grow their wealth without demanding a huge amount of investment. A trust which is managed by professionals that invest your savings in many assets for returns, and charge a fee for the same. The stock market is where the shares of publicly traded companies are issued and traded. They provide a particular portion of the ownership of the company in return for the money an investor invests. If you also wonder: "Which would be a better option for creating wealth? ", there are several points you should consider before choosing between the two. Trading in stocks, on the other hand, requires a thorough understanding of the market and a certain level of experience. It also requires a much larger amount for investing as compared to mutual funds. 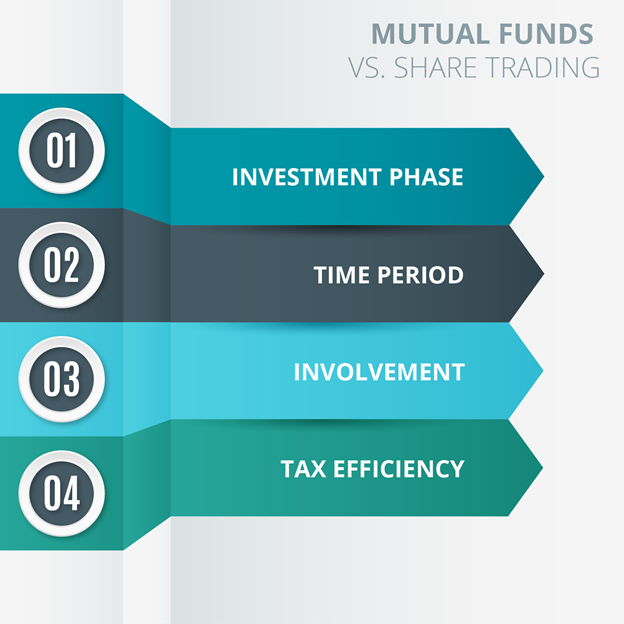 The main difference between mutual funds and share trading is the tenure you retain your assets to make a profit. Most mutual funds require a lock-in of a few years to make good returns. Stocks, on the other hand, are known to be the perfect tool for making quick cash in the market. You can buy the shares of a company today and can sell them whenever you want. This option of making quick cash also comes with an enormous amount of risk. However, this is not the case with mutual funds as they are more systematic and disciplined. So, if you are willing to take the risk for making quick cash, you could invest in stocks. But if you want a more disciplined approach towards your investments, mutual funds are the right option for you. If you don't wish to waste time tracking your investments, then mutual funds are perfect for you. You can invest in a mutual fund and just remember it from time to time to review your results. On the contrary, investing in stocks provides you the opportunity to look "under the hood" to see what you have invested in, how your investments are performing, the amount of risk you are taking, and how much actual profit you are making. In other words, mutual funds have very little transparency; real transparency can only be found if you invest in stocks rather than mutual funds. Trading in stocks is believed to be tax-efficient as it's up to you to buy/sell shares and make a profit. It is important to keep in mind that you have to retain your stocks for a minimum period of one year to avoid short-term capital gains tax when trading in stocks. If you have a stock broker to assist you with your financial needs, their fees can also be tax deductible. However, long term capital gains above Rs1 lakh in both equity shares and equity mutual funds are now taxable.